Award-winning design - Unlike other wine aerators on the market today, the HiCoup Aerating Pourer DOES NOT sit over your wine glass. Instead, it fits snuggly over the wine bottle itself, providing you with hands-free aerating and drip-free pouring. With most other wine aerators, you need two hands and you have to be pretty good at pouring so that you don’t drip anything. 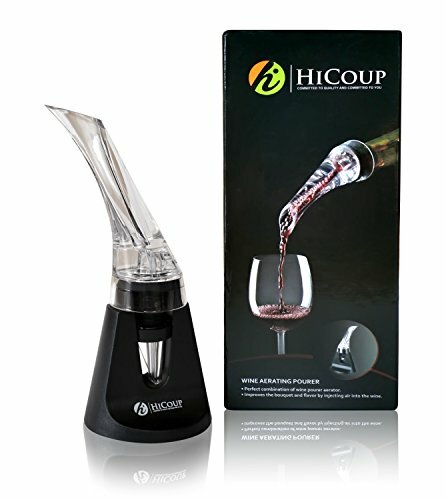 With the HiCoup Aerating Pourer, you simply press over the bottle, making sure that it’s snug, and then start pouring. That’s it. Just make sure the device is on securely, or you’re going to make a huge mess. Save time – With its specially designed dual air chamber, the HiCoup Aerating Pourer pulls twice the vacuum as the leading aerators to more fully oxygenate your wine, unlocking premium flavors and aromas. In fact, our aerator instantly adds the same amount of air as 30 minutes in a traditional decanter. Simply make sure that the wine is poured at a steep angle to facilitate the aeration. Our Aerating Pourer is also easy to clean. Simply hand-wash with warm water and let dry. 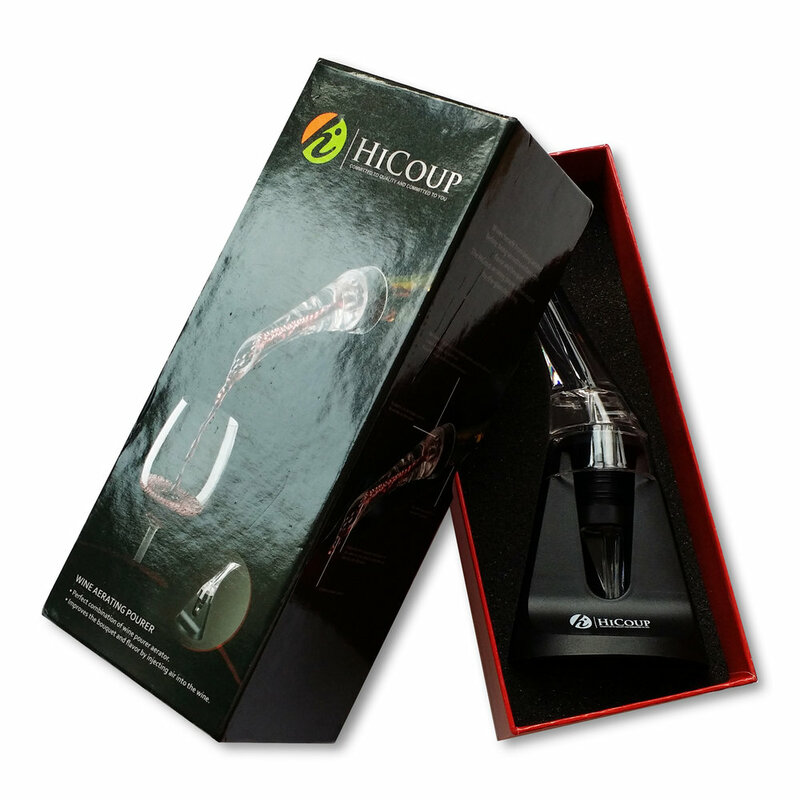 Save money – The HiCoup Aerating Pourer will allow you to taste the richness of the flavor and make your $10 bottle of wine taste more like a $25 bottle of wine, and a $20 bottle taste like a $40 bottle, saving you money in the long run while impressing your guests as well. Modern and sleek design - The light and compact size of the HiCoup Aerating Pourer offers effortless portability, allowing you to take it wherever you go. And it also comes with a stand. 100% manufacturer's warranty - We stand behind our products with a complete lifetime guarantee. If something breaks or if you don’t absolutely love your new Wine Aerating Pourer, we will take it back and offer a replacement or refund, no questions asked. That is part of our 100% LIFETIME CUSTOMER SATISSFACTION GUARANTEE! !